I love to make my own dog treats. With so many older dogs, and some that have certain dietary restrictions, it’s much better to make our own dog treats here. No preservatives, or artificial colors. We try not to add anything that isn’t healthy when we’re looking for dog treat recipes. We also like to be able to have lots of different flavors and textures of dog treats. And there are so many good dog treat recipes out there. Pinterest has a ton of new recipes that you probably haven’t tried yet. Well, here are five of our dogs’ favorite homemade dog treat recipes. Sweet Potato Chews/Fries – Our dogs love sweet potato treats. It’s a great change of pace from the normal meat flavored dog treats that you find in the stores. The crispy, sweet fries are at the very top of the list of all of our dogs. And I don’t think we’ve had a foster that doesn’t like them either. 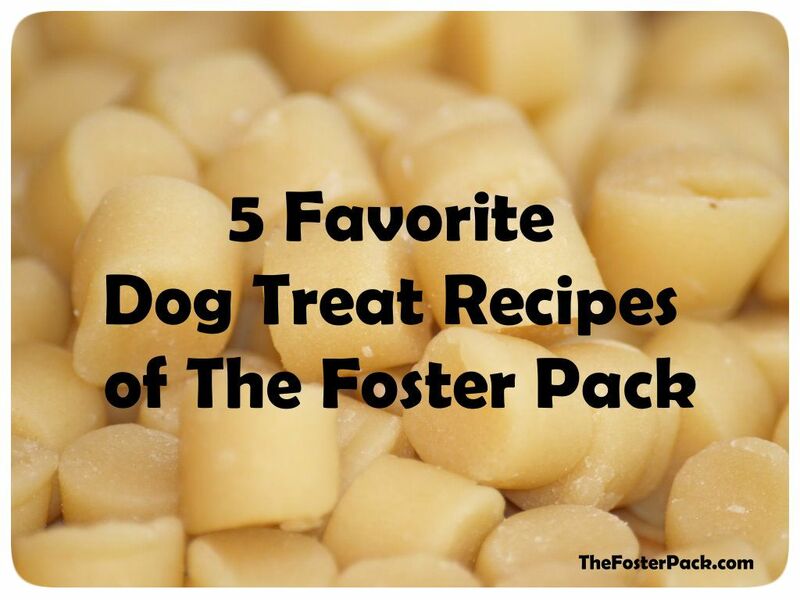 There are lots of variations of this dog treat recipe online. It’s quicker to bake them, but they can also be done in a [amazon_textlink asin=’B008H2OELY’ text=’dehydrator’ template=’ProductLink’ store=’fosterpack-20′ marketplace=’US’ link_id=’93fd2bef-2dc1-11e7-9435-ef192534df37′], for a more chewy texture. Coconut Oil and Turmeric – Although I don’t really think of these coconut oil and turmeric bites as dog treats, as they are a regular part of our dogs diets, for their health benefits, our dogs absolutely love them. Except Snuggles, who doesn’t seem to like any of the cold or frozen dog treat recipes that we’ve tried. So hers gets melted and mixed in with her food. Frozen Pumpkin Banana Dog Treats – Our pups like nothing better on a warm day than to scarf down their frozen dog treats. And they’re so easy to make when there’s no rolling and cutting out treats. Just mix it up, pour it into [amazon_textlink asin=’B01LZMRA16′ text=’silicone molds’ template=’ProductLink’ store=’fosterpack-20′ marketplace=’US’ link_id=’b609731d-2dc1-11e7-8bc2-c10e4629952c’], and pop them in the freezer. What could be easier. Apple Cheddar Dog Biscuits – These apple cheddar bites always go over well with our own dogs, and all of the foster dogs that crash here for a while. When I don’t have bacon grease handy, I substitute with coconut, or olive oil. Since our dogs are all on the small, and slightly overweight size, I often use my [amazon_textlink asin=’B00004OCIQ’ text=’apple corer’ template=’ProductLink’ store=’fosterpack-20′ marketplace=’US’ link_id=’c47095da-2dc1-11e7-a504-c50a62410081′] as the cookie cutter for these treats. It makes them the perfect size for everyone. Banana Carrot Dog Treats – Although these treats call for brown sugar, we leave that out. They seem sweet enough to satisfy our dogs’ sweet tooth without it. I, also, pulse the oatmeal into flour in my [amazon_textlink asin=’B000I0DV6W’ text=’food processor’ template=’ProductLink’ store=’fosterpack-20′ marketplace=’US’ link_id=’ce6b8367-2dc1-11e7-b444-e7b1c526ff4a’] first, they seem to like it better that way. And it makes them easier to roll, and cut out. We are always looking for great new dog treat recipes. What are some of your dog’s favorite treats? Cutest Baby and Puppy Ever!